Dangers of 'Whoonga': Abuse Of AIDS Drugs Stokes Resistance : Shots - Health News In South Africa, drug users are crushing HIV medications and mixing them with marijuana, heroin and other illicit drugs. Public health workers worry that people who smoke so-called whoonga are helping to fuel the rise of drug-resistant HIV. A whoonga smoker near Durban, South Africa, shows a crushed AIDS pill in the palm of his hand before mixing the drug with marijuana. 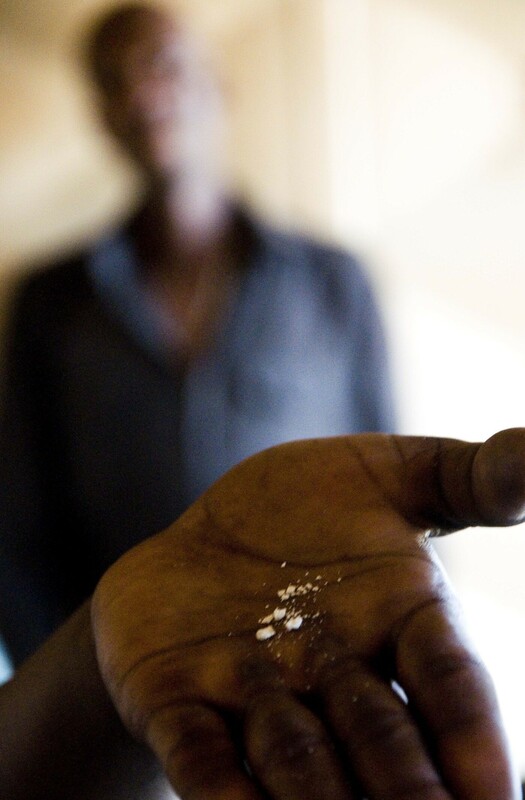 Opportunists who market street drugs may be undermining the global struggle against AIDS. In South Africa, two mainstay HIV drugs have found their way into recreational use. That may help explain why some HIV patients are resistant to these front-line medicines even if they've never been in treatment before. Or people can become infected with a strain of HIV that came from someone who used whoonga. "One large study showed 3 to 5 percent of people with HIV were coming in with pre-treatment resistance" to antiretroviral drugs used to treat HIV, Dr. David Grelotti tells Shots. Grelotti is a Harvard School of Public Health researcher who co-authored a commentary on the phenomenon in The Lancet Infectious Diseases published Tuesday. He says street use of efavirenz (sold as Sustiva in the U.S.) may exploit the HIV drug's well-known tendency to cause especially vivid and colorful dreams and other central nervous system effects. Hypothetically, that could enhance the effects of marijuana, methamphetamine, heroin and other illicit drugs. Another HIV medication, ritonavir, (brand name Norvir) is believed to boost or prolong the effect of some street drugs, such as MDMA or Ecstasy. Recreational users reportedly crush tablets of the antiretroviral medication and mix the powder with other drugs for smoking. Recreational use of HIV drugs isn't altogether new, though it hasn't had much attention. Some media reports documented illicit use of HIV drugs in South Africa as long ago as 2009. A 2007 report in the medical journal Pain Medicine documented recreational use of anti-HIV drugs among clubgoers in Miami. "I don't know of any evidence this is happening in a more widespread way in the United States," Grelotti says. But he says very little is known about the extent of recreational use of these drugs, outside of anecdotes and media reports that are now several years old. His group decided to call attention to the issue so doctors would think about possible recreational use in prescribing efaverenz and ritonavir. They can use alternatives, though this can be a problem in poorer countries with limited choices of antiretrovirals. Aside from the resistance problem, illicit use of HIV drugs poses other dangers. "Each time a medication is misused, you assume somebody else is not getting it for appropriate use," Grelotti says. In addition, recreational use can make legitimate users of these drugs, and the clinics that dispense them, targets of thieves and violent crime. And it can only add to the stigma of an already stigmatized group of patients.